We’re happy to announce we have a new Maker this year that helps connect people + clay! And best of all, they will be providing a hands-on experience to get you playing with clay. Cammie Meerdink is the artist behind Piper Pottery + Crafts. For over 20 years, she has been playing in the mud – turning clay into beautiful and functional ware. Based in Seymour, IL, the studio’s name comes from the artist’s maiden name and that of her youngest child. With three kids, a husband, and a part time job as a nurse, life is full! Cammie creates and teaches both hand building and wheel thrown pottery in her home studio, as well as hosting classes at locations in several area communities. 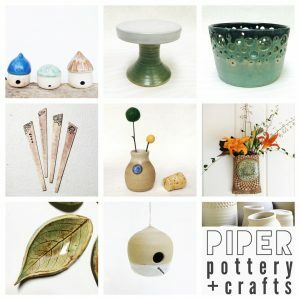 Worked in stoneware clay, the home and garden décor created at Piper Pottery is safe for ovens, microwaves, dishwashers, and outdoor use (as long as temperatures stay above freezing). These pieces are meant to be used and enjoyed.